The Deal: Hallie and Grace Weston are going through a rough time: their father has died and left everything to his new wife (the woman he left their mom for) and baby; and their artist mother is more distracted than ever. Soon, their step mother Portia kicks them out and the gils are forced to move to L.A. with relatives, where ever the Drama Queen Hallie seems to thrive in her own way while younger sister Grace is trying to keep it all together. 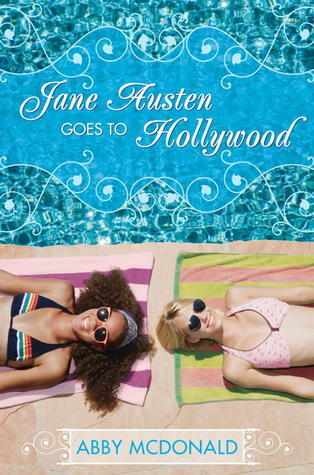 My Thoughts: Jane Austen Goes to Hollywood is basically and upside-down modernized version of Sense and Sensibility, and for the most part I rather liked it. The twists and updates were pretty smart and ballsy and I think the spirit of the story was kept. I liked the characters even though I thought Hallie was a bit over the top and annoying, and Portia was so mean and I got so mad at Hallie and Graces dad and, and their mom too, for their neglect. Aside from that, it was okay. I really disliked the title (sounds like a lazy title to me, somehow) but the writing was fun. Didn't like it as much as I did Abby McDonald's previous book Getting Over Garrett Delaney but it was a fun way to pass time anyhow, and I've certainly read worse Jane Austen Retellings.